A recent post laid out some of our favorite travel memories of the Northeast, and while the majority of our travels will focus on exploring new places, there are also a number of destinations that are drawing us back. Here is a look at the places that we are itching to get back to now that we're stationed in the Northeast. You will notice a consistent theme if you read this site consistently. We love Quebec City. From the beautiful walled city center perched above the St. Lawrence to to the charms of the surrounding countryside, the festive atmosphere to the thriving food scene, Quebec has something for almost everyone, and we can’t wait to get back. We look forward to walking the old city again, looking out over the river from Terrasse Dufferin, letting the kids loose on the Plains of Abraham, taking in Montmorency Falls, and driving out to Ste. Anne de Beaupre and the Ile d’ Orleans. Selfishly, it will also be nice to have some pictures of the city without the Chateau Frontenac shrouded in scaffolding, as it was during our last trip. We do have plans to visit over the upcoming 4th of July holiday. Caroline was only 6 months old the last time that we visited; it’s fitting that she’ll be 6 years old when we return. We can dust off our broken French for the first time in a couple years, and it’s always fun to watch our kids embrace other languages and cultures as they get older. We also foster hopes of returning for the Winter Carnival next February for one of the most unique and vibrant (if admittedly very cold) festivals in North America. In 2012, I spent one day in Maine. It was not enough. That one day fell at the back end of a May family vacation to Cape Cod. Jessica and Caroline (our only child at the time) had flown back early for a family wedding, and my parents and I were in charge of driving the car back to Ohio. We had one extra day before I needed to be home, and we decided to visit Maine “on our way” back to the Midwest. Our plan was to drive up the coast a bit, experience a small slice of the Maine coast we’d heard so much about, and turn around and head for home. We never meant to make it as far as Acadia, but we were all in by the time we hit Ogunquit. A few hours later, we were at the summit of Cadillac Mountain and enjoying the scenic drive around the Park Loop. Jessica and the kids have never been to Maine, and I’ll look forward to showing them around. Acadia will definitely be a focus, but the state’s numerous lighthouses and the jagged coastline that they overlook will capture our attention for the rest of our visit. Although Washington, D.C. is one of our favorite US cities, the passion that we have to return here over other family favorites like Boston or Pittsburgh can be summed up by two words: cherry blossoms. We’ve long been intrigued by the beauty of cherry blossom season in D.C., but the prospect of planning a long range trip around such a fickle season has been a bit daunting. Now that we’re within reasonable driving distance of D.C., we won’t let that stop us from braving the crowds in 2018. Of course there are other reasons that we’d be excited to go back to D.C. The museums can keep our family busy for days, and the combination of cosmopolitan atmosphere and monuments is hard to beat on this side of the Atlantic. That said, if we do make it back next spring, it’s likely to be the little white flowers, not the monuments or museums that have our primary attention. My only visit to Fallingwater, Frank Lloyd Wright’s masterpiece in Western Pennsylvania, was over the summer before my first year in the Architecture program at Michigan. I was driving back to school from a short time on the East Coast, and I felt compelled to make a stop at arguably the world's most famous private residential design. The intricacies of the design can be better explained by someone skilled in architectural writing, but the house itself is stunning. The beauty of the site is obvious from the classic shot of the many cantilevers protruding out over the waterfalls of Bear Run, but there are other moments (the approach up the driveway, the stairway down to the water, the curving path up to the garage) that still stick with me long after my initial visit. 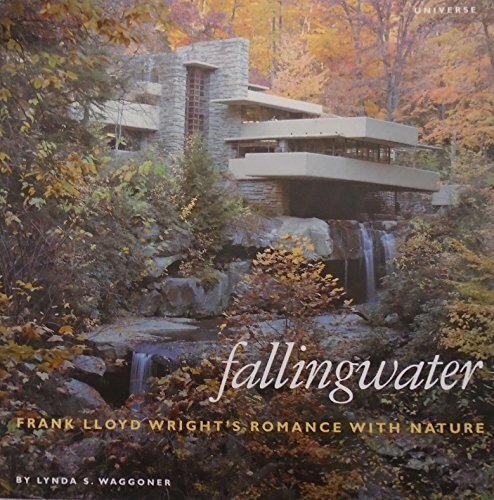 Being 2003, I didn't have a camera on me at the time (which explains why you're seeing the cover of a book I bought at the time instead of a personal image), and it would be nice to go back and experience Fallingwater in a new way. The fact that the house is closed to children under 6 years old does present a roadblock for a return visit, but we’ll see what we can do. It feels strange to reserve a place on this list for a place that I’ve already been 4 times this year, but it’s proven impossible to omit. Although Jessica and I have made over a dozen visits to NYC, our kids have actually never seen it, and it will be right on our doorstep. At this point, our list of New York favorites reads like a tourist (Central Park, the Flatiron Building, the Brooklyn Bridge, Chelsea Market, Broadway shows, the Highline, the Chrysler Building, etc. ), but we want to capitalize on our proximity to the city to develop a more local perspective. I’m sure there will still be sightseeing involved (our girls are very excited to see the “Statue of Livverty”, for example), but we hope to get there often enough to get a much better feel for the city’s neighborhoods and flow, the off-the-beaten path eateries, and the places that New Yorkers go to relax. Without traffic, our home in Connecticut is barely over an hour’s drive from Times Square, but anyone living in the area knows that we won’t often face virgin road conditions. On the other hand, train journeys for a family of 5 can get expensive quickly, and it will probably take some trial and error to understand how we best navigate these potential barriers to get into the city as often as we can. A list of our favorite new experiences will follow shortly, but in the meantime, please let us know some of your favorite destinations in the Northeast you're looking forward to getting back to.